Hey guys! I hope you're all doing well and enjoying this summer. It has been crazy hot in Ontario (at least where I am) and we desperately need some rain! I would say Fall is my favourite season, so I can't wait for our September and October months to get here! Again, just a quick apology for lack of posts this summer. I am finding it difficult to get good photos, and then writing a review off my phone is difficult and gives me issues every time, so I try and avoid it. Which is obviously not good. But I will try and work on that. At least the summer is almost over and I will finally be able to get more into a blogging rhythm. Enough blabbering about that. Let's get into the good stuff! 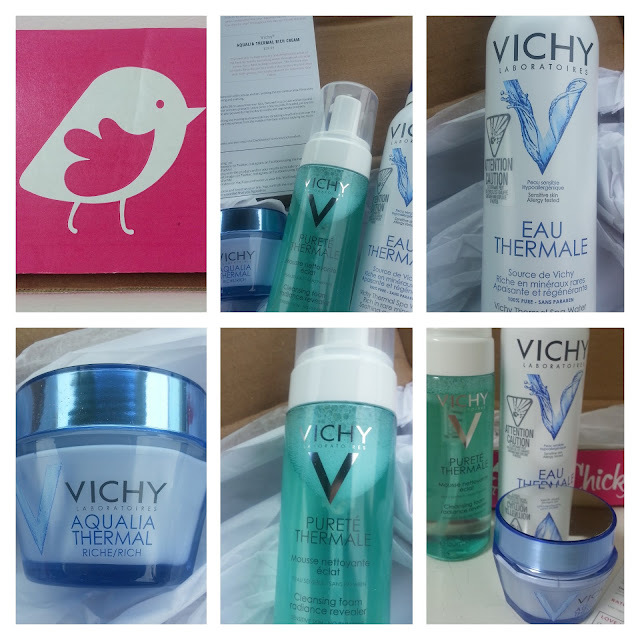 Today's post is about some skincare products in the Vichy Thermal(e) line. I added that e because some product names have it, and others don't. 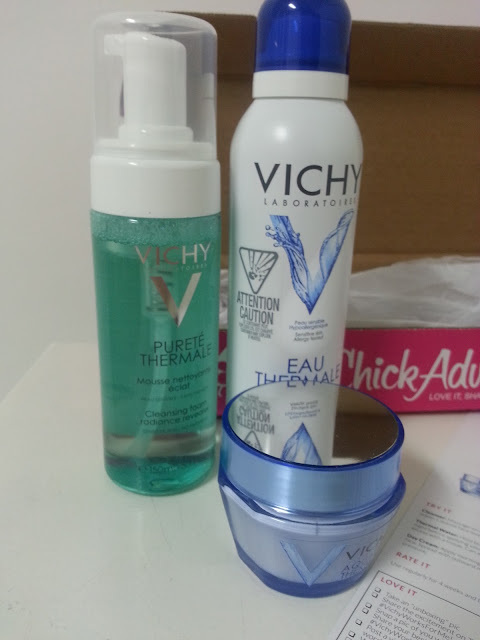 First off, I was sent these products from ChickAdvisor. This review will be 100% my opinion based on my experience only. 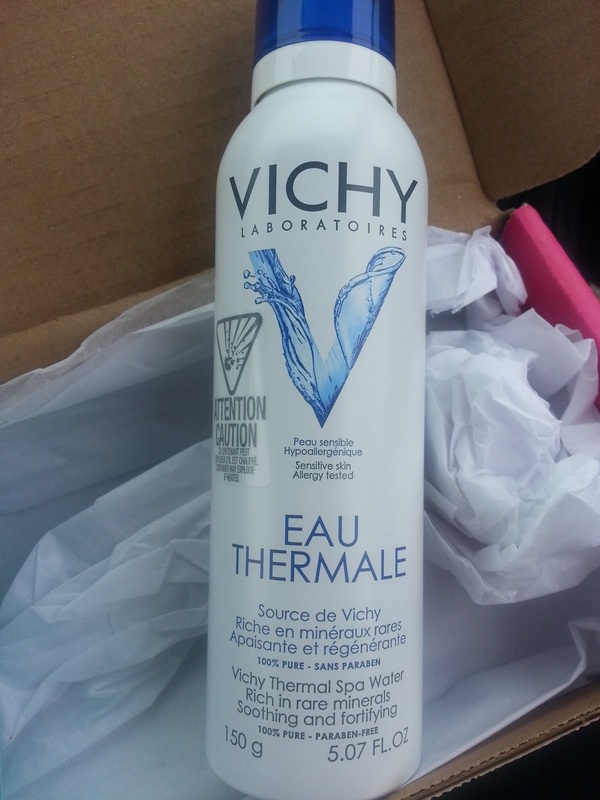 I was sent 3 Vichy products to test, Eau Thermale, Purifying Thermale, and Aqualia Thermal. My review will go in order of how each step is used! Usually at the end of the day I will use an oil cleanser. This takes off makeup and I find it really helps keep my skin moisturized. The next step is either a creamy cleanser or a foaming cleanser. This ensures I removed all of my makeup, while cleansing the skin. 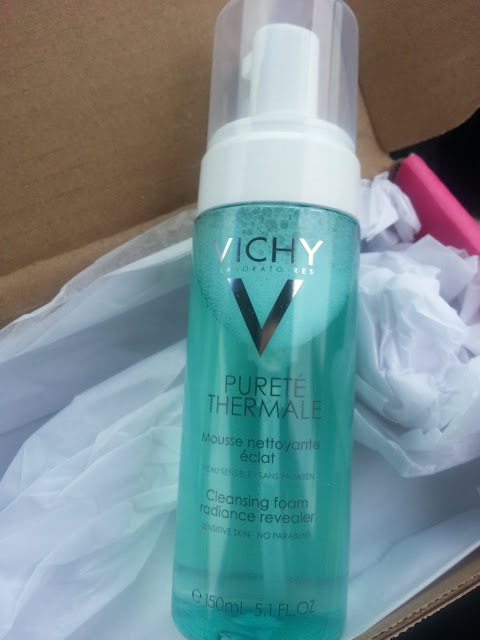 The first product we will look at from this Vichy line is Purete Thermale Purifying Foaming Radiance Revealer. This has a super long name, but to simplify it, it's a foaming cleanser. As I mentioned above, I like to cleanse my face first with an oil cleanser and then go in with another cleanser. Most people choose foaming cleansers for their second step, but I generally choose creamy cleansers because I have dry skin. I usually associate foaming cleansers as being drying on the skin, so I tend to avoid them as much as I can. However, this cleanser is different. It was created for those with dry skin and need hydration. I was surprised that this foamed into a richer type of foam. It didn't make my skin feel tight or dry after using it, and the second best part is that it removed some leftover mascara that was just hanging out under my eyes. The only dislike I have is the scent. It is a little floral but it's not overly strong, so I can look past it as I continue to use this cleanser. Great surprise! After washing your face with the foaming cleanser, you dry your face and then move onto the next step. Also known as Eau Thermale. I have only every tried one other "spa" water before. I find them to be very refreshing and can be used after cleansing your skin, between skincare steps, before applying makeup, after applying makeu,p and anytime during the day to give your skin a quick hydrating boost! I did enjoy this and use it a lot after applying makeup because sometimes my skin felt tight. The bottle is a little small though and the spritzer is not as fine as it could be. But I really enjoyed how my skin felt after using it. The final product I was sent is supposed to be the last step in your skincare routine. I try and follow more of a Korean skincare routine, so this wasn't always last on my face. However I did give it multiple tries as my last step. 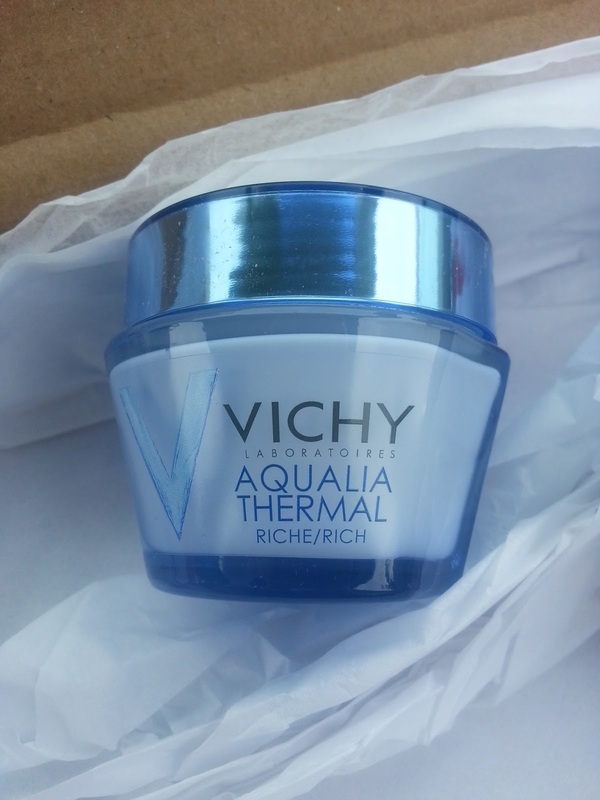 It was never specified whether to use this as a day cream or a night cream, so while I tested it, I used it as both. Because why not. I like using a richer cream during the day because I find it helps keeping my skin feel hydrated. Most lotions are too thin and my skin internally feels as if it's soaked it all up and is gasping for more hydration. This is definitely a richer type of cream but it isn't greasy at all. It reminds me a lot of the Lise Water cream a lot of us were sent a few months ago from Glam Sense, but this is more of a cream opposed to the more gel texture of the Lise Watier. As a day cream, meh. I wasn't too impressed. I found it made my foundations or powders look splotchy, even if I let it soak into my skin for over 5 minutes. I also found it balled up a lot, especially in my cheeks and jawline areas. I will say though, my skin did feel very hydrated while I wore it under makeup, but it just looked ugly. Even with a primer. As a night cream, meh. (I seem to be meh on this one!) I tend to enjoy a really rich cream for at night. My skin needs to drink up as much as it can, and I really love to slather it all on at night. So on its own at night, it wasn't enough and I found myself often adding a face oil or a sleep pack, to give my skin the super hydration it needs. Now this definitely isn't a bad product, because I enjoyed how my skin felt while using it, it just isn't the best product for my skin, I feel. As a system, I felt everything worked well with one another. My skin never reacted in a negative way. There was no sudden breakouts, or irritation. And my skin truly felt hydrated. I think those with more of a normal/dry skin type would benefit more from the cream, then those with super dry/dehydrated skin types. Overall, it was enjoyable to try out some good quality skincare items that don't get talked about nearly as much as they should!